It's a better choice than the iPad Pro for a lot of users. Amazon sells a Kids Edition of its Fire tablet, which is the exact same tablet they sell for adults, but in a kid-friendly case, with a year’s worth of the FreeTime Unlimited service for kids apps and content. Apple does not do this. 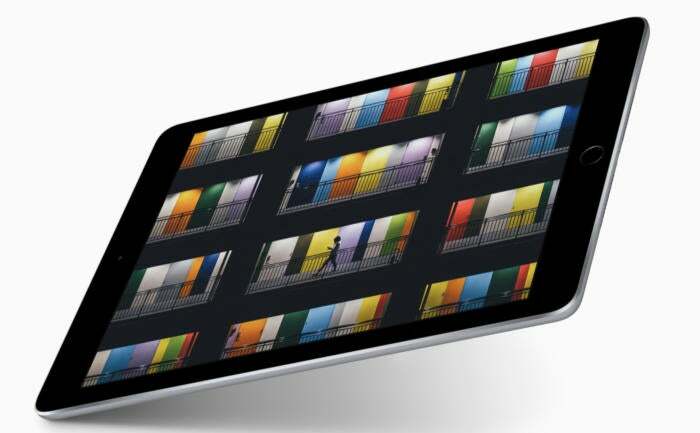 But at $329 for 32GB of storage, the new iPad is pretty close. This is a great iPad at its most family-friendly price, and certainly a better buy for kids than the $599 iPad Pro. Now, obviously you won’t get all the same features or technology that’s in the more expensive iPad Pro. The new 2017 iPad is more or less a mashup of parts we’ve seen before: the same A9 chip that powers the iPhone 6s, the same size and weight as the first iPad Air (minus the physical lock switch, sadly), and the same camera as the iPad Air 2. This is more of a throwback than a brand-new product, kind of the iPad equivalent of the iPhone SE. And you know what? That’s fine with me. Now that the iPad has been around a while, and we’ve seen what the use cases are and how long they tend to last, a low-cost, full-size iPad is just what the lineup needed. An iPad is basically a screen you hold in your hands, so the screen quality is important, and Apple didn’t skimp on this one. First of all, it’s plenty bright. Apple says it tops out at 500 nits, thanks to a stronger backlight, which is the same brightness as the 9.7-inch iPad Pro, and 25 percent brighter than the iPad Air 2. It can still be tricky to see in the very brightest sunlight, but overall you can notice the improvement. The 9.7-inch iPad Pro has the P3 color gamut as well as SRGB, and iOS manages the colors so you always see the most accurate image. The same iPad Pro also has True Tone, which further adjusts the display to match the color temperature of the room’s lighting. This new iPad has neither of those: no True Tone (although it does have Night Shift), and just SRGB color. But since those features are available on the higher-end tablet, it makes sense to cut them from the lower-cost model—they’re nice-to-haves, not need-to-haves, and I haven’t missed them when using the new iPad in a variety of lighting situations. 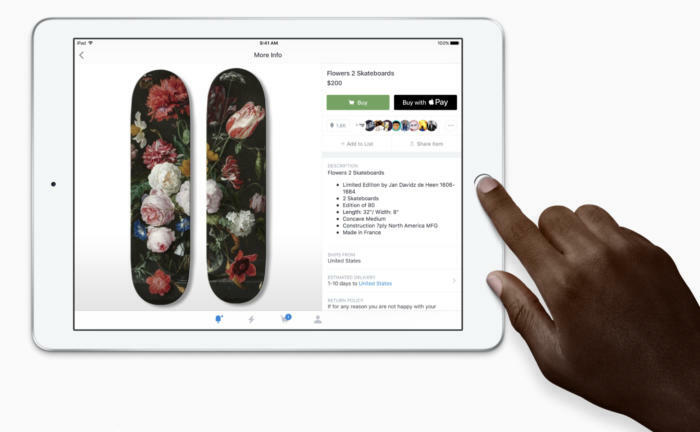 The new iPad also lacks Apple Pencil support, the iPad Pro’s four-speaker setup, as well as the Smart Connector. Again, I don’t miss them much. The iPad gets loud enough to watch movies and TV and enjoy music without relying on headphones or a Bluetooth speaker, even if the sound doesn’t have all the gravitas of the iPad Pro’s. Yes, it has a headphone jack, and let’s pray that iPads always will. The main reason the new iPad is nearly as good as the iPad Pro is how well it runs the thousands of iPad apps. The A9 chip is the third generation of the 64-bit A-series chips, and it also brings a better image signal processor and more accurate M9 motion coprocessor than the iPad Air 2’s A8X. Apple says the new chip is more battery efficient, plus the new iPad has a slightly larger battery than its predecessor. (The battery is 32.9 watt-hours, the same as the first iPad Air. The slimmer iPad Air 2 shaved the battery down to 27.6, and interestingly, the 9.7-inch iPad Pro’s battery is 27.9.) I had no trouble beating Apple’s 10-hour estimate consistently, with one video-streaming test stretching to 12 hours, 44 minutes. The iPad starts up quickly, unlocks in a flash with the speedy Touch ID button, and runs heavy apps like Pixelmator, Lightroom, and GarageBand with no sweat. It scored 2251 in Geekbench 4.1’s single-core CPU test, and 4417 in the multicore CPU test, putting it right between the iPad Air 2 and the iPad Pro in terms of performance—right where you’d expect. 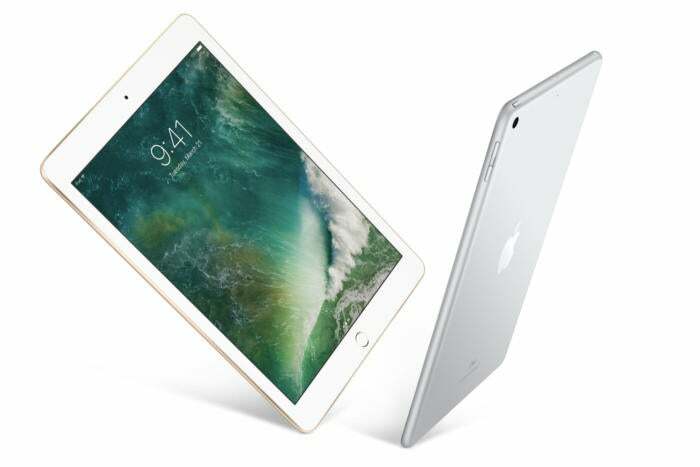 The 8-megapixel rear-facing iSight camera, and the front-facing 1.2-megapixel camera aren’t changed from the iPad Air 2, but the coprocessor that controls them—the image signal processor—is. Like the iPhone 7, the iPad’s ISP assembles multiple frames each time you take a photo, which should reduce noise and give you a sharper, clearer result. 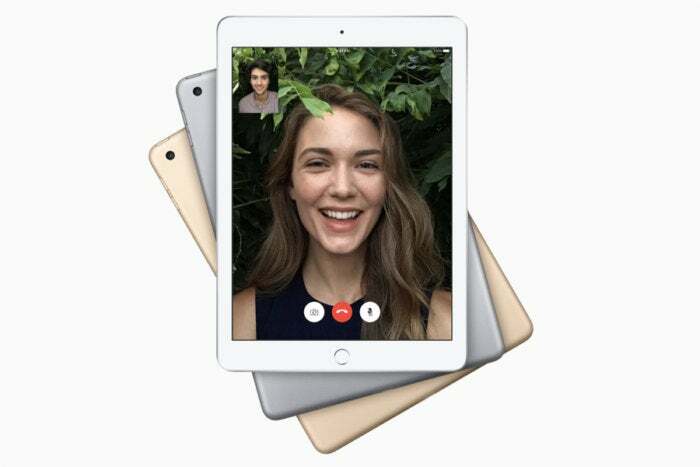 I don’t take a lot of pictures with my iPad—I’m more likely to have my iPhone handy when a photo opportunity strikes—but a good camera is still important for video chatting, augmented reality, and creative fun like stop-motion animation or Apple’s new Clips app. Oh, and the camera sits flush with the back of the iPad, unlike the 9.7-inch iPad Pro, which has a slight camera bulge. 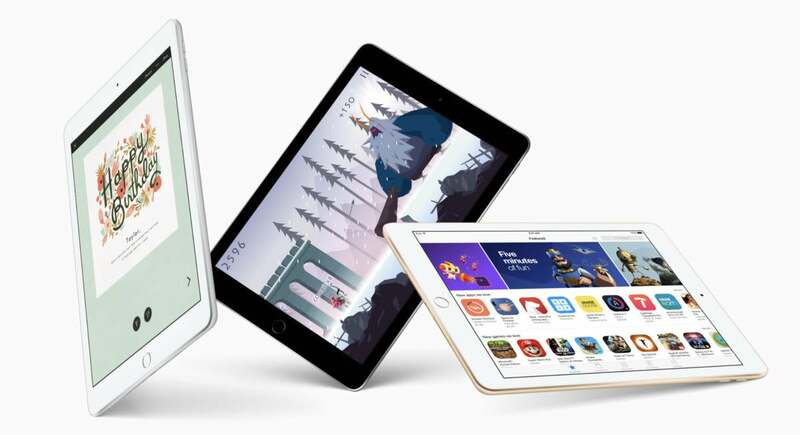 iPad, iPad Pro, or iPad mini? Which iPad should you buy? The iPad mini is still around, but down to one SKU, 128GB of storage for $399. So if that’s the size you like, this feels like a “now or never” moment. It’s got an A8 chip, which is 64-bit, so it should support iOS updates for a while, although it seems a given that Apple would stop supporting the iPad mini before the A9-equipped 2017 iPad. In fact, Apple didn’t even give this iPad mini a new generation number: It’s the same fourth-generation iPad mini first introduced in the fall of 2015. You just get more storage for your $399: now 128GB, up from the 16GB it launched with in 2015 or the 32GB it was bumped up to in 2016. So if you need tons of storage, you’ll save a little bit opting for the 128GB iPad mini 4 for $399, instead of the 128GB iPad for $429. But since that $30 difference gets you a bigger iPad with a newer processor, I don’t think the iPad mini 4 will be overwhelmingly popular. It feels like a clearance product. If you’re trying to choose between this $329 9.7-inch iPad and the $599 9.7-inch iPad Pro, there are a couple factors to consider. If you know you want the Apple Pencil or Apple’s Smart Keyboard, you’ll need the Pro of course. But there are capable third-party alternatives for both of those accessories that would work with the regular iPad, like Adobe’s lovely Ink stylus and Logitech’s Bluetooth keyboard cases. For me, the value of a $329 iPad outweighs the novelty of the Apple Pencil or Smart Keyboard. Add cellular for $130 more, and you’re still spending less than you would on the Wi-Fi-only iPad Pro. However, if you intend to do real work on your tablet day in and day out—treating it like a laptop—you might want to future-proof your investment a little by selecting an iPad Pro with the more advanced A10X chip, or even waiting a bit to see if and how Apple refreshes the iPad Pro lineup this year. This story, "iPad (2017) review: With a stripped-down iPad for $329, you may not need to go pro" was originally published by Macworld.